Phobya's innovative new shroud does not only improve cooling performance, it also offers a whole array of new design possibilities for your system! The shroud increases the cooling performance of your fan/ radiator combination. Mounted between fan and radiator it allows a more even distribution of the Airflow, hence using the whole cooling surface of the radiator. If a fan is mounted on a radiator directly the fan motor creates a dead-spot which leaves some of the radiator's surface unused, reducing the possible cooling performance. Multiple shrouds may also be used on top of each other using longer mounting screws to increase cooling performance even more. The appearance of a PC grows more and more important besides the performance of the system. 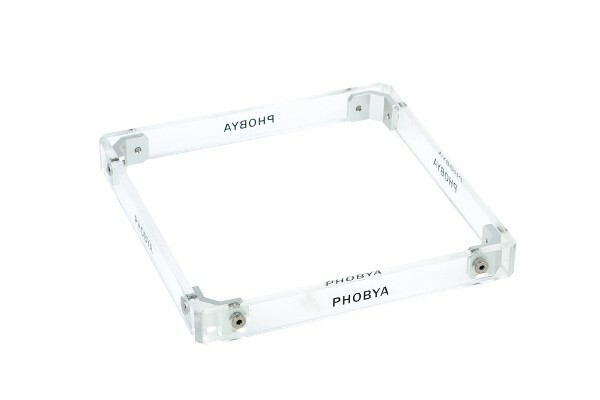 Phobya has also considered this factor and has made these shrouds from Plexi. If you are using LED fans this allows an interesting and unique effect which will make your system even more of an eyecatcher. Should the luminance from the fan not suffice it is also possible to insert 5mm LEDs in the side of the shroud, bringing the before optically dead space between fan and radiator to life!